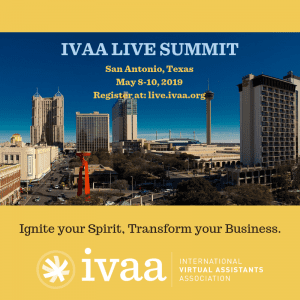 Although IVAA is now the premier networking and support organization for virtual assistants worldwide, it was born in one person’s home office. From her rural home in Connecticut, Christine Durst founded the Virtual Assistance industry in 1995. She believed the Internet could open her door to global business, and she was correct. With Michael Haaren, she co-founded Staffcentrix and IVAA separately but simultaneously — with the intention of staying at the helm of the former and turning the latter over to its members as soon as membership reached meaningful numbers. IVAA was incorporated as a non-profit organization in 1999 and became officially recognized as a 501(c)(6) on February 2, 2001 with 28 members. Since then, IVAA’s membership has grown to more than 600, in 16 countries. Collectively they conduct business worldwide, via the Internet. The Board of Directors is now comprised of five officers and five directors-at-large. Said Durst, “I met’ Mike in 1998 when I was operating My Staff and a client of mine referred him to me. At the time, Mike was the CEO of Catalytik!, a consultancy specializing in business growth advisory services for small businesses. “IVAA was actually Mike’s idea,” she continued. “As a former Wall Street Attorney, he had seen too many good business models turn sour when growth was the primary focus and nobody was tasked with ensuring ‘healthy growth’. IVAA, he suggested, would be the parent organization of the VA industry. It was our aim to make the industry big; but as a for-profit company that would surely have competitors coattailing it, Staffcentrix could not also attempt to be an unbiased player in the VA industry. “My VA practice was thriving,” Durst continued. “I had about 14 clients and I was loving it! As time passed, I began receiving a significant number of queries from women and men who wanted to know how to become VAs and I did my best to answer as many of them as I could. Soon, I realized I was spending more hours helping VA wannabes than I was working on client work. Further, I really liked it! Though the work I was doing for my clients was satisfying, the gratification that came from helping people get started as VAs was so much more fulfilling. “The concept of Virtual Assistance is not new,” said Jodi L Diehl, past president of International Virtual Assistants Association. “Although the term Virtual Assistance became popular in the 1990s, individuals have worked as ‘telecommuters’ for more than 25 years. Carolyn Moncel, of Motion Temps, LLC telecommutes from her home in Paris, France to clients in the United States and the United Kingdom. “In this organization,” she said, “I have not only found a wealth of valuable information for running my practice, but I have also met some wonderfully talented people — some who have become friends and close colleagues. My IVAA membership became even more important when my family moved from Chicago to Paris because it provided a great support center for me while I made adjustments to my business. “Between (the years) 1995 and 2004, fees charged by VAs have increased nearly three-fold,” says Durst. “When I opened my VA practice in 1995, I was billing at $12/hour for administrative support. When Mike and I launched IVAA and Staffcentrix in 1999 we immediately began a campaign to introduce the media and thereby the hiring public, to the VA concept. In doing so, we were always careful to stress that employees cost 2 to 2.5 times more than their hourly wage.” Today, IVAA members charge from $15 to well over $100 per hour for specialized services. IVAA now offers free web hosting account to members, a forms library and the Request for Proposal (RFP) System to help potential clients locate the best VA for their needs. Molly Alexander Darden, of The Word Mason, is a professional writer and editor specializing in both fiction and non-fiction.